Ever since Dublin City council published details of Option 7 as its preferred route for Liffey Cycle Route along the Quays, back in October, I have been highlighting the potential impact this plan would have on the residential neighbourhoods of Stoneybatter, Church Street, Arbour Hill, Montpelier, Infirmary Road and Phibsborough. At the recent public meeting organised by myself and local Minister, Paschal Donohoe T.D., in Stoneybatter, I provided a brief outline of the proposal, how the City Council Executive have envisaged it operating and where the private vehicles would be re-routed to from the Quays. That meeting heard a significant level of concern from local residents and businesses being expressed. At the meeting, I committed to seeking an update on the status of the Traffic Impact Assessment only now being undertaken by the City Council. In seeking that update, I wanted to know how Owen Keegan, Chief Executive of the Council proposes to manage the increased traffic volumes through the residential neighbourhoods of Stoneybatter, Church Street, Arbour Hill, Montpelier, Infirmary Road and Phibsborough. I also committed to ensuring that a meaningful local consultation be held by the City Council to enable our affected communities to have a proper say on the proposal. Last night’s City Council meeting provided me with the opportunity to put those questions to Owen Keegan. Firstly, the consultation process. The Chief Executive has now stated publicly that should he seek to proceed with Option 7 then he would initiate a Part VIII planning process. That means that permission could only be provided to this plan by your City Councillors. Prior to that, a statutory based public consultation process would be launched giving Dubliners the chance to air their views about Option 7 of the proposed Liffey Cycle Route. I welcome the Chief Executive’s decision to commit to such a consultation as I believe the previous informal consultations undertaken to date have been flawed. “At present we are examining a number of options for the Liffey cycle scheme and how we can handle the difficult and constricted sections of the north quays at Ellis Quay and Arran Quay. One option that is under consideration is to allow buses and taxis only use this section and divert general traffic both north and south of the Quays. The number of cars potentially to be diverted per day is in the order of 5,000 and it is not considered that all of the cars that currently use this section will divert to the north side with some diverting earlier, some to the South and some to alternative modes. The reply provided is yet again disappointing and in my view unsatisfactory. It is disappointing in that the traffic impact assessment has still not been concluded. Again, I struggle to understand why the City Council did not undertake this level of analysis before putting forward Option 7 for consideration of the Transportation Committee. It is unsatisfactory in that a figure of 5000 cars per day is mentioned yet when I put similar questions to officials previously, I was told 600 cars per hour and on another occasion 400 cars per hour. The City Council’s Executive cannot seem to get their facts straight on this. Managing this proposal has been extremely poor from the start. 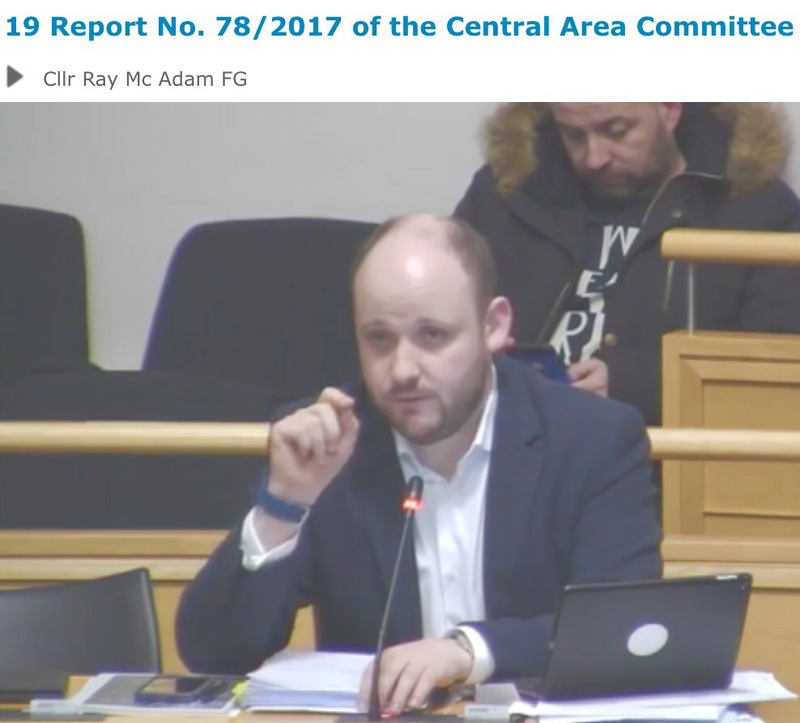 The failure to provide any concrete information as to how the proposal will impact Stoneybatter and other districts in the north-west inner city has created a huge amount of uncertainty, anger and frustration. Indeed, the dressing up of this project as a cycle project by the Chief Executive and Council officials is misleading and wrong! The Liffey Cycle Route and Option 7, in particular, represents a major re-organisation of traffic management in the City Centre and the proposals contained therein pose a huge threat to the quality of life for residents across Stoneybatter and the north-west inner city. I will continue to lead the resistance to any proposal associated with the Liffey Cycle Route that will have a detrimental impact on Stoneybatter, Church Street, Arbour Hill, Montpelier, Infirmary Road and Phibsborough. Furthermore, I’ll keep residents updated of my work on the matter. This entry was posted in Arbour Hill, Church Street, City Centre, Dublin City Council, Fine Gael, Grangegorman, Montpelier, North Circular Road, Phibsborough, Quays, Smithfield, Stoneybatter. Bookmark the permalink. Any plans to do something about the driver who killed a cyclist in broad daylight in your area yesterday? I am disappointed in this article from you. For me the liffey cycle route is one of the most infrastructure projects and will have enormous benefits for people living in Dublin city including my family as we regularly use the phoenix park by bike. I have voted for you in last 2 elections and i have no problem in you asking questions to help allay fears of people of stoneybatter but I would expect you to have all the facts including learnings from other countries and consider all your constituents before fighting this worthwhile initiative. Thanks for your observation, the contents of which I have noted. I would be more than happy to discuss my position on proposed option 7 and how as currently proposed will impact Stoneybatter. If you want to email me when is good for you, I’ll meet you. Look forward to hearing from you further. Please note that many of us would be interested in notes from this discussion, if you could share.